Joy Creek Photo Archive (c) all rights reserved We have grown Clematis 'Ekstra' (1982) since the late 1990's after a visit to Estonia where we visited the bountiful garden of the hybridizers Uno and Aili Kvistik. The flowers of 'Ekstra' are distinguished by frilly crimping along the edges of the sepals. In addition, the base of the pale, violet blue sepals is rose-colored beautifully complementing the red purple of the upper portion of the filaments. 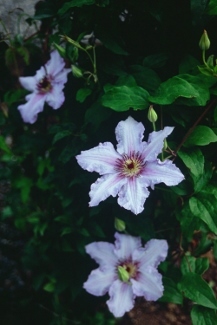 This easy-to-grow clematis is ideal for containers or small trellises. July to September. 6-9 ft.